Halloween is quickly approaching and Amazon has a spook-tacular Blu-ray deal this week! 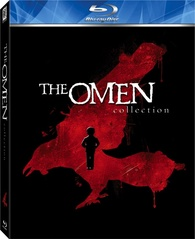 The online retailer's deal of the week is 'The Omen Collection' for $19.99 (67% off suggested price). The collection includes: 'The Omen,' 'Damien: Omen II,' 'The Omen III: Final Conflict,' and 'The Omen 666' (the 2006 remake). Click here to summon this Blu-ray set to your home! This offer is in effect from now through October 15.